Overtake Driving Arcade Machine is a street racing video arcade game in which players can ride solo, competing against the computer, or, they can enter a heated, head-to-head competition with up to 3 friends. Players can choose from 6 popular racers, and each vehicle has distinctive features and various types of Turbo Jet Boost for more speed and a higher intensity race. It also comes with 3 game modes, including Time Trial, Race Mode and Multi-Player Mode! The game features diverse track combinations, scenery and the player's ability to remodel their cars in unique ways, making this more fun and customized to suit the players and what they want. Vehicles are equipped with various types of lighting and the "vibration" functions, so when vehicles are hit or Turbo Jet or Boost is used, significant vibrations will be felt by player's seat to enhance their race experience, and feel the intense atmosphere during race competitions! 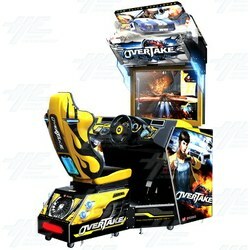 Overtake Driving Arcade Machine is a street racing video arcade game in which players can ride solo, competing against the computer, or, they can enter a heated, head-to-head competition with up to 3 friends. Players can choose from 6 popular racers, and each vehicle has distinctive features and various types of Turbo Jet Boost for more speed and a higher intensity race. It also comes with 3 game modes, including Time Trial, Race Mode and Multi-Player Mode! The game features diverse track combinations, scenery and the player's ability to remodel their cars in unique ways, making this more fun and customized to suit the players and what they want. Vehicles are equipped with various types of lighting and the "vibration" functions, so when vehicles are hit or Turbo Jet or Boost is used, significant vibrations will be felt by player's seat to enhance their race experience, and feel the intense atmosphere during race competitions! Gameplay of Overtake game during the 2013 GTI Asia Taipei Expo Trade Show.